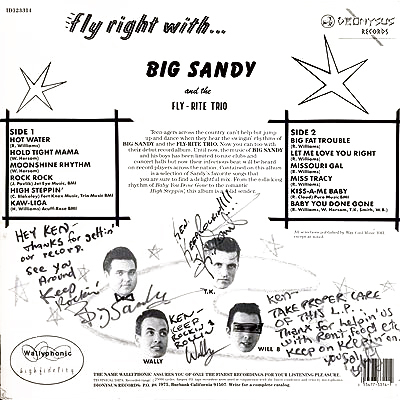 Notes: A very early piece of Big Sandy vinyl. 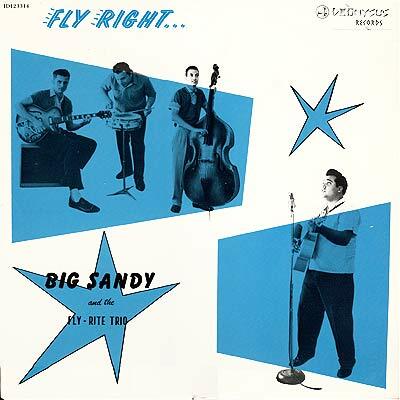 The rockin' record has some great Sandy originals and a fine cover of Hank Williams' "Kaw-Liga". Straight forward sincere rockabilly with a bit of swing class thrown in for good measure. I've seen the band live a few times in small venues and had the opportunity to speak with Sandy and his band. These are people that love the music and love what their doing. Even in a tiny little room they rock like it might be their last time. Always worth the price and the drive. This copy is signed to "Ken" by all the members. Don't know who Ken is, but it seems like the were rather fond of him. Great cover photos on a fine record. Go see Sandy live and buy his albums, you won't be sorry.